Capped at PHP 500 for every order purchased. [App Only] Clinique Custom-Blend Hydrator now available on LazMall. Get Cashback on Orders with this Voucher! Buy Clinique Custom-Blend Hydrator on Lazada through ShopBack. Get the best discounts plus cashback. No code required. Lazada terms and conditions apply. Valid for app users only. Valid until supplies last. [App Only] Use this Lazada Voucher and Get Up to 75% discount on Mango Grand Launch Sale! Buy Mango apparel for a low price on Lazada through ShopBack. Get up to 75% off discount plus cashback. No code required. Lazada terms and conditions apply. Valid for app users only. Valid while stocks last. [App Only] Generation Happy Skin Active exclusive bundles now available with Lazada Sale! Buy Generation Happy Skin Active collection on Lazada through ShopBack. Get the best discounts plus get cashback. No code required. Lazada terms and conditions apply. Valid for app users only. Valid while stocks last. [App Only] Take Up to 90% discount + FREE shipping for Taobao Collection New Arrivals with Lazada Voucher! Buy Taobao Collection men and women's apparel, shoes, accessories and more for a low price on Lazada through ShopBack. Get up to 90% off on selected items and FREE shipping when you buy 3 items and above plus get cashback. No code required. Lazada terms and conditions apply. Valid for app users only. Valid while stocks last. [App Only] Anastasia Beverly Hills now available on LazMall. Get Cashback on Order with this Voucher! Buy Anastasia Beverly Hills on Lazada through ShopBack. Get the best discounts plus cashback. No code required. Lazada terms and conditions apply. Valid for app users only. Valid until supplies last. [App Only] Samsung Galaxy S10 now available on LazMall! Order now and Get Cashback with this Lazada Voucher! Buy Samsung Galaxy S10 on Lazada through ShopBack. Get the best discounts plus cashback. No code required. Lazada terms and conditions apply. Valid for app users only. Valid until supplies last. [App Only] Enjoy Up to 40% off on Bavin Electronic Deals with Lazada Discount Voucher! Buy Bavin phone charger, powerbank, cables and more for a low price on Lazada through ShopBack. Get up to 40% off on selected items plus cashback. No code required. Lazada terms and conditions apply. Valid for app users only. Valid while stocks last. [App Only] Enjoy FREE shipping when you spend P500 on Garnier Serum Mask! No Voucher Code Required. Buy Garnier Serum Mask for a low price on Lazada through ShopBack. Get up FREE delivery when you spend P500 on Garnier Serum Masks plus cashback. No code required. Lazada terms and conditions apply. Valid for app users only. Limited time only. [App Only] Get 50% Discount on Skechers Shoes Sale with this Lazada Voucher! Buy Skechers shoes and apparel for a low price on Lazada through ShopBack. Get up to 50% off plus cashback. No code required. Lazada terms and conditions apply. Valid for app users only. Limited time only. [App Only] Silver Works Disney Princess Collection now available on LazMall! Get Cashback with this Voucher. Buy Silver Works Disney Princess Collection on Lazada through ShopBack. Get the best discounts plus get cashback. No code required. Lazada terms and conditions apply. Valid for app users only. Valid while stocks last. [App Only] Get Up to 33% discount on Maybelline Cosmetics with this Lazada Voucher! Buy Maybelline makeup for a low price on Lazada through ShopBack. Get up to 33% off discount plus cashback. No code required. Lazada terms and conditions apply. Valid for app users only. Valid until stocks last. [App Only] Get Up to 25% discount on St. Ives Glowing on Lazada! No Voucher Code Needed. Buy St. Ives skincare and body care for a low price on Lazada through ShopBack. Get 25% off discount plus cashback. No code required. Lazada terms and conditions apply. Valid for app users only. Valid while stocks last. [App Only] Travel with Style Sale on Lazada! Get Up to 70% Discount with this Voucher! Buy Travel essentials for a low price on Lazada through ShopBack. Brands like Adidas, Delsey Paris, Puma. Get up to 70% off discount plus cashback. No code required. Lazada terms and conditions apply. Valid for app users only. Valid until stocks last. [App Only] BYS Luster Perfume now available on LazMall! Get Cashback with this Coupon. Buy BYS Nadine Lustre Luster Perfume on Lazada through ShopBack. Get the best discounts plus get cashback. No code required. Lazada terms and conditions apply. Valid for app users only. Valid while stocks last. [App Only] Get Cashback on Pond's White Beauty line! Now available on LazMall! Buy Pond's White Beauty on Lazada through ShopBack. Get the best discounts plus cashback. No code required. Lazada terms and conditions apply. Valid for app users only. Valid until supplies last. [App Only] Mask Party Sale with Deals for as low as P80 on Lazada! Buy face mask for a low price on Lazada through ShopBack. Brands like Simple, St. Ives, Laneige and more Get the best discounts plus cashback. No code required. Lazada terms and conditions apply. Valid for app users only. Valid until supplies last. [App Only] Buy 2 and Get 20% off on Keds Shoes with this Lazada Voucher! Buy Keds shoes for a low price on Lazada through ShopBack.Get 20% off discount when you buy 2 on selected items plus cashback. No code required. Lazada terms and conditions apply. Valid for app users only. Valid until supplies last. [App Only] Enjoy 30% discount on Huggies Diapers at Lazada Philippines Sale! Buy Huggies diapers for low price on Lazada through ShopBack. Get up to 30% off discount plus cashback. No code required. Lazada terms and conditions apply. Valid for all customers. Limited time only. [App Only] Shop Nestle products on LazMall! Use Voucher to Get Discounts! Buy Nestle grocery items on Lazada through ShopBack. Get the best discounts plus cashback. No code required. Lazada terms and conditions apply. Valid for app users only. Valid until stocks last. [App Only] Use this Lazada Voucher and get 40% discount on Jansport Bags! Buy Jansport bags for a low price on Lazada through ShopBack. Get up to 40% off discount on selected items plus cashback. No code required. Lazada terms and conditions apply. Valid for app users only. Valid until stocks last. [App Only] JBL Voucher on Lazada! Enjoy Up to 60% discount! Buy JBL earphones, speakers, headphones and more for a low price on Lazada through ShopBack. Get up to 60% off discount on selected items plus cashback. No code required. Lazada terms and conditions apply. Valid for app users only. Valid until stocks last. [App Only] Take 40% OFF on Havaianas Flip Flops Sale at Lazada Philippines! Buy Havaianas Flip Flops for a low price on Lazada through ShopBack. Get up to 40% off discount on selected items plus cashback. No code required. Lazada terms and conditions apply. Valid for app users only. Valid until stocks last. [App Only] Asus Zenfone Max Pro M2 now available on LazMall! Get Cashback on this Promotion! Buy Asus Zenfone Max Pro M2 on Lazada through ShopBack. Get the best discounts plus cashback. No code required. Lazada terms and conditions apply. Valid for app users only. Valid until stocks last. [App Only] Get Cashback on Jimmy Choo Deals now on LazMall! Use this Voucher to avail. Buy Jimmy Choo perfumes on Lazada through ShopBack. Get the best discounts plus cashback. No code required. Lazada terms and conditions apply. Valid for app users only. Valid until supplies last. [Android App Only] Take 25% discount on selected Levis deals on Lazada Philippines Sale! Buy Levis apparel a low price on Lazada through ShopBack. Get up to 25% off on selected items plus cashback. No code required. Lazada terms and conditions apply. Valid for all customers. Limited time only. 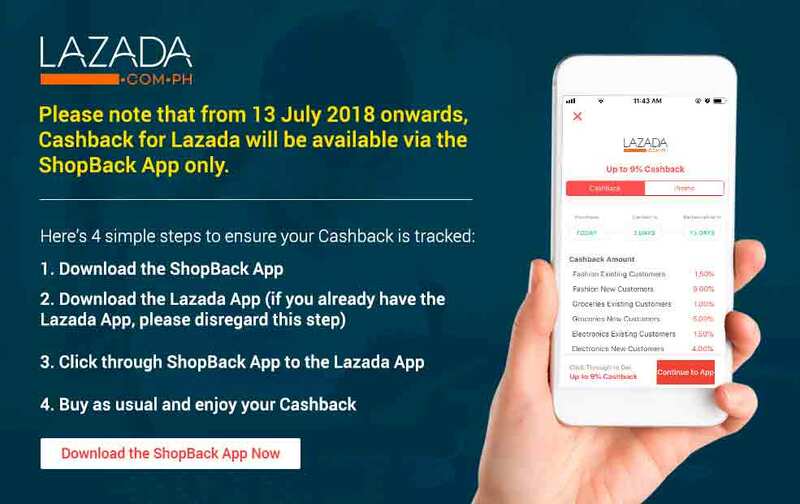 [Android App Only] Buy load on Lazada + Get Cashback with Lazada Coupon! Buy load for a low price on Lazada through ShopBack. Networks like Globe, Smart, Sun and more. Get the best discounts plus cashback. No code required. Lazada terms and conditions apply. Valid for all customers. [App Only] Yi Cameras Up to 70% off with Lazada Voucher! Buy YI dash camera, home camera, sports camera and more for a low price on Lazada through ShopBack. Get up to 70% off discount plus cashback. No code required. Valid for all customers. Valid until supplies last. We are currently undergoing system updates for Lazada to serve you better, therefore, Cashback on Lazada is temporarily paused. Do check in soon for further updates. After all, we are all human beings and we always wish to get something more out of things. For the shopper in you, there are better and smarter ways of getting Lazada vouchers than searching the whole of the internet. A quick visit to Shopback will ensure a wide smile on your face. The website has quite a few discount coupons and they are regulated quite frequently. What this means for Lazada Philippines customers is that they never run out of any promo or sales events. You can take a look at the benefits of Lazada vouchers available on before deciding to proceed with the same. You can expect some mouth watering sale from the cashback site. Depending on the products that you are looking for, you can end up with massive discounts as much as 70-80% on select products. There is no better place to look for Lazada promo codes than Shopback. You just need to login to the website and search for Lazada sale. The website will do all the hard for you and present the best deals and offers available. Once you are happy with a deal you can proceed with the same. At times, these will have coupon codes that you can use during your payments as mentioned above. Or there might be inbuilt discounts and you just need to follow the link to get discount on the items you are looking for. To add more on the thrills of these promos, Lazada's vouchers will also be available on ShopFest for 11-11 and 12-12 Online Revolution sale. So all online shoppers will have the luxury to shop for less prices this Christmas shopping season. When you shop via Lazada you get far more benefits than just the convenience of shopping from the comforts of your home. There are a lot of coupons and codes that give you healthy discounts on your purchases. Most of the products that you purchase from the Lazada platform come with standard free delivery; which is quite different from other online marts which either do not entertain free shipping or charge you a certain amount for the same. You can use Lazada coupon codes in the payment section of your purchase and benefit from it. Some of these promo codes would give you instant monetary benefits while other can result in cashbacks. When you get to the payment page, you will find a box named Enter Voucher Here. This is precisely where you can enter the vouchers and avail the benefits. On the home page of Lazada, you will come across a tab called daily promotions. These are primarily deals of the day and have a very limited time frame within which one must claim them. Should you decide to buy any products from this category, you will end up saving a lot of money. The deals over here do not require any specific voucher codes. If it is your day, you will find products from your favorite brand listed under heavy discounts under this segment. For an instance you could expect deals for specific debit or credit cards such as Citibank. Or you could avail discounts on Samsung products. The deals might be applicable to international products as well. Since, these change on a day to day basis, the best approach is to keep an eye out on a regular basis. This way, you will be able to bring down your shopping expenses by a decent enough margin. Buying things online is without any doubts one of the biggest boons that we have currently. If you start from the basics, you can sit back and relax on your sofa, sipping a cup of coffee and buy things using just your fingertips. Going online keeps you away from the insane and mundane traffic conditions as well. And the best part of it all, you end up paying lesser for things when you buy them online. But it can get a bit confusing to choose the right platform to shop from. Given the immense amount of potential business the online space has brought in, numerous players have jumped in. But only a handful has shone like Lazada. The website is an online marketplace which allows users to shop a whole lot of things under their banner. If you are anywhere in Southeast Asia and want to buy something online, Lazada has a ton of things on offer for you. Lazada came into existence in the year 2012 in Singapore. A German based e-commerce company founded the Rocket Internet, which in turn brought the Lazada Group into existence. The same entity that built and founded Zalora. The central idea behind creating the group was to mimic the business style of Amazon and reach to places where the tech giant hadn’t placed its foothold. The intention was also to tap into the relatively nascent online space in the Southeast Asia region. All the strategists at Rocket Internet take a close look at emerging technologies and companies in the United States of America. Then they got to the drawing boards to visualize if something very similar can be done in places where such services are not available. Lazada being an online shopping destination, there is a lot of things that you can buy from it. Starting from electronics to home appliances, from baby care to fashion, from gadgets to sports related stuff you will find products catering to all of these categories and many more. The company currently operates in 6 Southeast Asian countries namely, Malaysia, Indonesia, Thailand, Vietnam, Philippines and Singapore. The brand has caught the attention of some big investors including Summit Partners, Tesco, JPMorgan Chase etc. The site is not limited to shopping only as you can sell your items on the platform also. Since its inception, the brand has been able to garner interest among a large number of people and has amassed a large customer base. The company offers a variety of service on its platform and here is a list of some of these services. If you are in the search of products such as cameras, speakers, audio devices, computers, laptops, home entertainment appliances, televisions, mobiles or printers, Lazada is your ideal shopping destination. It consists of products from various brands when it comes to the above categories. These are again major categories and the website has further subcategories for these. For an instance, when you select laptops, you can further drill down into chromebooks, 2 in 1 laptop, macbooks, gaming laptops or just plain old laptops. Similarly, the television category holds several sub categories such as QLED televisions, OLED televisions, plasma televisions, LCD televisions and so on. Under this category one will be able to find products such as vacuum cleaners, small and large kitchen appliances, cooling and heating solutions, irons and so on. Some of these categories are split into sub categories. For starters, the cooling and heating solutions can be split as air conditioners, air coolers, heaters, humidifiers etc. Again, each of these are mere categories and internally would contain actual products from different vendors. The website doesn’t upset people who are extra cautious when it comes to health and beauty products as well. You will easily find products for hair care, makeup, fragrances, skin care, food supplements, medical supplies, personal care and so on. These groups further make way for smaller categories such as body scrubs, hair removal solutions, sun care, hair conditioners, shampoos etc. Always offering a lot of products when it comes to people who like decorating or keeping their houses in top notch conditions. You can find products for your bath, bedding, lighting, DIY kits, kitchen, furniture, books etc. Each of these categories have enough products to keep the enthusiastic home maker in you extremely happy. Not only does the platform provide home based products and personal use products, it also caters to products related to sports and outside activities. You can choose from various team sports, racket based sports, water sports, sports accessories, sports clothing for men and women, exercise and fitness related items and so on. Whether you are looking for equipment for cricket, football, rugby or boxing gloves, MMA gloves or boxing pads, you will find them all under this one-stop online shop. An online mega market will be almost incomplete without any products for babies. Lazada Philippines offers you products such as baby personal care, baby gear, diapers, feeding, nursing, toys, games, sports equipment and the list goes on. If you have a young one at home and are unable to find some time to walk to your local shop and buy things, simply log on to Lazada. If you have had any experience with online shopping, you will find yourself home at Lazada. For the individuals who haven’t, well it is not all really simple to get around and shop. You simply need to visit the website or down its app either from App Store or Google Play and a large chunk of your work is already complete. You can browse through the above mentioned categories and take an organized approach to your shopping. Alternatively, you can simply search for a product in the search bar on the top of the page or app and the app does all the hard work for you. When you land on the product page you can go through the various details provided. If you are satisfied and want to proceed with the product purchase, you can click on the ‘add to cart’. At this point you can either choose to go back and continue shopping or proceed to checkout. Lazada would then ask you to provide contact details such as email id or phone number to continue with your shopping. Existing members can login using their credentials and new members can choose to create a new account. After that you need to provide your delivery location details and then continue with your payment mode. You can either use debit cards, credit cards, PayPal, BDO installments or cash on delivery option. After you are done with the payment, you can click on the place order button, which finalizes the purchase. All the hard is now complete, you can just relax and track your order while it makes it way from the warehouse to your house. Since Lazada completely operates using its mobile platform and website, clear communication is of utmost importance. As soon as you are done with your payment, the website sends out a confirmation email to your registered email id. This consists of the products purchased along with an estimated date of delivery of the product(s). This acts as your source of truth and has all the details you might need to contact should there be a need for it. For an instance, you can refer to the order id in your emails to reach out to by their representatives in case of any discrepancies. If due to some reason you do not wish to continue with the product that you have order, you can cancel the same. To cancel the order, you must login to the app or the website. Once you login you must go to my orders section and search for the order you had placed recently. You can cancel the order by mentioning the reason behind it. When you shop on Lazada, you get a grace period for all the items purchased. If you are not happy with your purchase, as in you received an item that differs a lot from its product description, the product is tampered with or damaged, you can opt for a refund. You can either exchange the product or opt for refunds and get another product on its behalf. For any organization to grow immensely across different countries, a strong customer service team is of utmost importance. Should you have any queries regarding your orders, payment or anything else for that matter, you can check out the FAQs section. Lazada offers a live chat option to get all your queries answered on the go, without having to wait for a longer duration. Alternatively, you can reach out to Lazada at (02) 795 8900.